We have been dumping the waste water from our washing machine on the back lawn for years now. It seemed like an easy thing to sort out with the back of the house being 5-6 feet higher than the ground, and the backyard sloping away more after that. I’d previously cut a hole in the floor and run a pipe through and out the back steps to a longer pipe which we move around the back lawn as we remember. There has always been the worry that the machine may be pushing too much water for its motors capacity, despite the gravity drop of 5 feet or more. 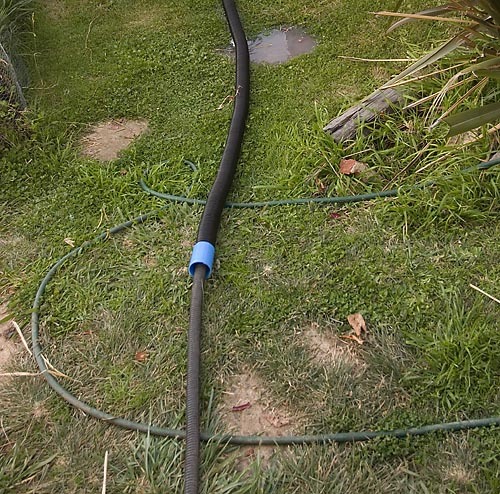 And sometimes the pipe across the lawn doesn’t drain out fully, so it can be the case of the motor having to push this collected water ahead of it, or possibly drawing it back into the machine, resulting in dirtier washing than you started with. Hence, the latest addition, a surge tank to collect the rush of waste water from the washing machine and allow it to slowly, gravity feed out via the original pipe and a short length of agi pipe. 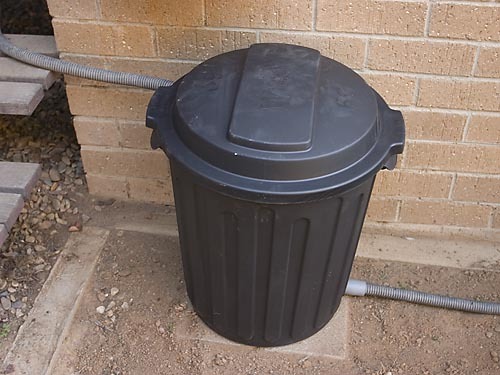 We used a new molded garbage bin as the tank and several joiner pieces as the entry and exit points for the pipes. I managed to make the lower hole in the tank a tight enough fit for the joiner to make it water tight without additional sealant. The end result is fairly neat and tidy. I even made a small paving stand for the tank. We seem to be washing clothes constantly at our place so it wasn’t long before the system could be tested. All good, although the agi pipe does empty its contents fairly quickly and over a small area. Not sure how to get it spreading out more. Perhaps by running it across the slope the run off will be over a greater area? First test – no leaks! 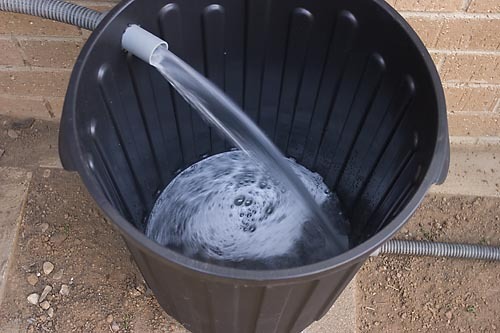 This project has me thinking of other ways to use waste water from the bath and shower.